When I first started doing graphic design, one of the first things I wanted to do was labyrinths. Original medieval-style labyrinths, not Chartres redone. Unfortunately, the only directions on how to draw labyrinths I could find were for the classical style. So I started trying to draw some anyway, but I kept getting stuck. I was thinking of labyrinths as a series of barriers. Once I started thinking of them as paths interrupted by barriers, everything started falling into place. 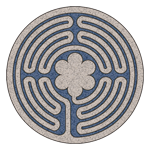 Both designs have several versions, including the base labyrinth design and one including the phrase “Life’s a Journey.” After all, isn’t that what labyrinths teach us?